Congratulations to all the members of the Juilliard community who were nominated for Grammys; the award ceremony took place on February 12. 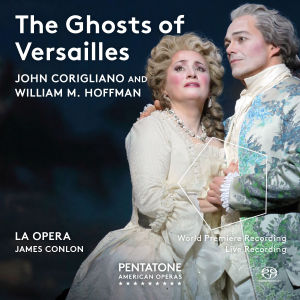 The LA Opera recording of composition faculty member John Corigliano's 'The Ghosts of Versailles,' which was conducted by alum James Conlon, has been nominated for a Grammy. Jazz faculty member Ted Nash was a big winner, with “Spoken at Midnight” voted best instrumental composition and the Ted Nash Big Band's Presidential Suite: Eight Variations on Freedom named best large jazz ensemble album. Nash's “We Three Kings” had received a nomination for best arrangement; it was recorded by the Jazz at Lincoln Center Orchestra under Wynton Marsalis ('81, trumpet), head of the jazz program. Miles Ahead, a documentary about Miles Davis ('45, trumpet) that takes its name from one of his albums, received the award for best compilation soundtrack for visual media. John Williams's ('55, composition) music for Star Wars: The Force Awakens won for best score soundtrack for visual media. Composition faculty member John Corigliano's The Ghosts of Versailles took home two Grammys, for best opera recording and best engineered classical album; James Conlon (BM '72, orchestral conducting) conducted the L.A. Opera. Rouse: Odna Zhizn; Symphonies 3 & 4; Prospero's Rooms, featuring works by composition faculty member Christopher Rouse, was nominated for best orchestral performance; faculty member Alan Gilbert (Pre-College '85; MM '94, orchestral conducting) led the New York Philharmonic performance. Zuill Bailey (MM '96, cello) received the award for best classical instrumental solo for Michael Daugherty's Tales of Hemingway, which also won the best contemporary classical composition award. Gil Shaham ('90, violin) was also nominated for best classical instrumental solo, for Prokofiev and Bartók concertos on 1930s Violin Concertos, Vol. 2 (Canary Classics). Jennifer Higdon's Cold Mountain, as recorded by the Santa Fe Opera and mezzo-soprano Isabel Leonard (BM '04, MM '06, voice), and Mason Bates's (Barnard-Columbia-Juilliard Exchange '99; MM '01, composition) Anthology of Fantastic Zoology had also been nominated for best contemporary classical composition. The Spektral Quartet—which includes Clara Lyon (BM '08, violin)—had been nominated for its album Serious Business (Sono Luminus) in the category of best chamber music/small ensemble. Yo-Yo Ma (Pre-College '71; Professional Studies '72, cello) and the Silk Road Ensemble won the best world music album for Sing Me Home; a documentary featuring the group, The Music of Strangers, had been nominated for best music film.